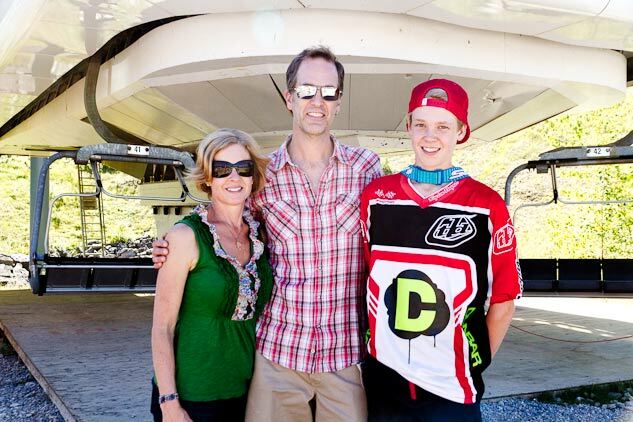 Colin, Marilee and Jake at the Fernie BC Cup; racing has strengthen their family bond. 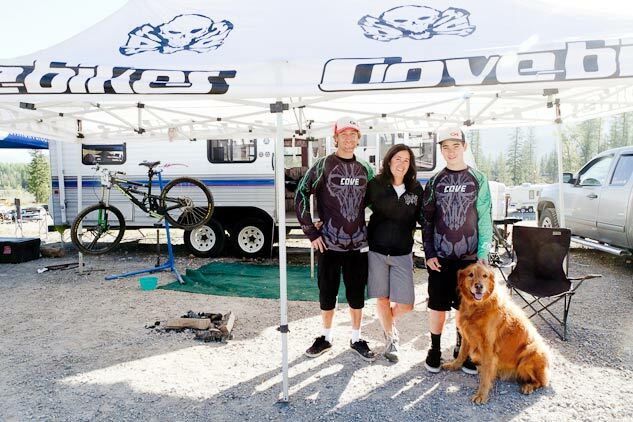 When the last downhill race of the season happened this past weekend, as a community, we were saddened. We felt the immediate void of anticipation for the next event. Practice and training suddenly took on much longer-term goals and the memories of the good times shared would have to suffice for the long winter months. Especially lost and forlorn were the racers' parents, while they too look forward to the next season, they also feel the time slipping away. After another season spent driving their kids from race to race, investing time, money and moral support, it was over. And it might never be the same again. 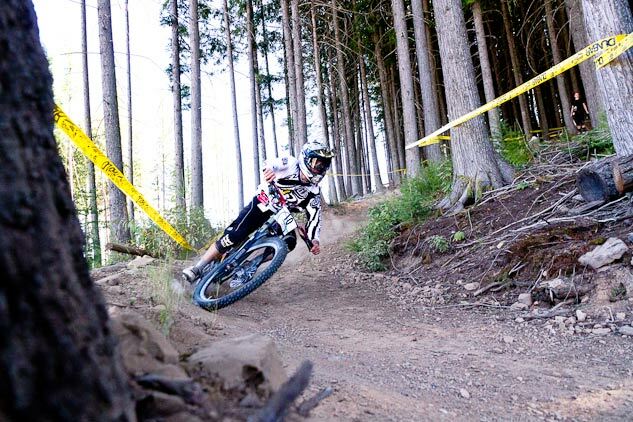 Jake during a practice run at the last BC Cup of the year. The pits at races are full of campers and RV's, kids and family pets, general chaos and parents who look around and exclaim "I wouldn't change this for the world." The scene is more National Lampoon than Norman Rockwell, but the opportunity to travel as a family and be inspired by their children's commitment to a sport is all the reward needed to balance their devotion. As one racer's father eloquently explained, "if you provide your children a chance to find something that they are passionate about, and give them the support and encouragement required to pursue that passion, it will benefit them not only in their formative years, but also for life in general." These families spend many miles on the road each summer, investing in a sport that has little to offer in financial return; this is not an investment in a basketball scholarship or NHL contract, and yet the transition to fall is still hard for them. It marks another year gone, and another year heading toward change. The inevitable slow down in race attendance, and the shift in priorities to college, jobs and girls. 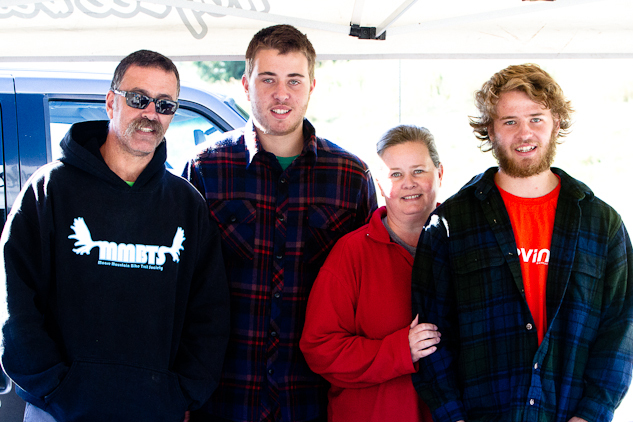 Richard, Logan, Loyal and Cody have been travelling to races together for eleven years. The return gained in life lessons, the diversion from less desirable avenues, and the strengthened family bonds are what stand out over podium placements and awards. The less tangible benefits are what drive the parents in their commitment. They have seen their kids develop time management skills, goal setting and focus, as well as, a directly applying it in other areas of their lives. With one track to talk about, walk, practice and race, these events breakdown division in interfamily relationships. There is an opportunity to build on a shared interest that could have brought Cinderella and her stepsisters closer together. Just look at how happy the Athertons are. It can be hard to explain just how special the experience is, how intense racing can be, and more importantly exactly just how cool it all is, but sometimes when the parents are lost for words, the silence says it all. Cody rails a corner during timed practices. His brother was unable to race due to a shoulder injury sustained during a practice run earlier in the day. As the kids grow up they want to spend more time with their teammates and peers, and racing may begin to take them further away to compete, it can be hard to let go. 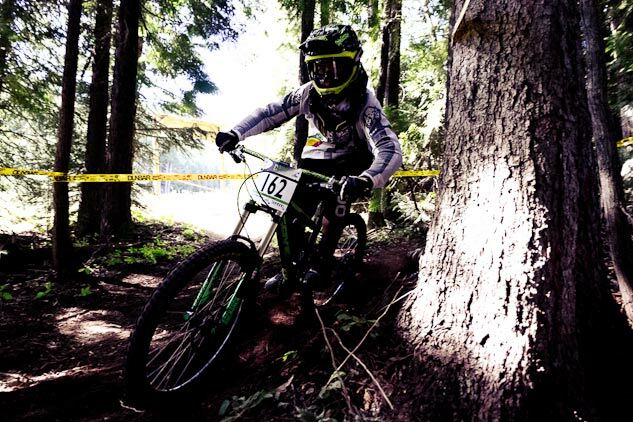 Downhill racing is considered an individual sport, something that may spur the initial want for families to travel with their kids, but it does not take long to realize that there is very much a team atmosphere. And the parents acknowledge the additional growth potential here. Teammates can provide life skills and experiences that families cannot, a dynamic range of life and racing experience and important lessons like wearing goggles while shooting fireworks at each other and how to steady amount of good natured verbal abuse. Susan, John and Nic pose for a family photo in front of the lift at the Fernie Alpine Resort during the last BC Cup of the season. While one mom keeps a journal to remember all the moments that made this summer the best one yet, another says she accepts the coming changes but would keep travelling to races year after year if she could. One set of parents have already accepted the inevitable as their son stayed with his team at this race, but they still drove twelve hours to be at the finish line. In the end these trip are as much an investment for them as they are for their children. 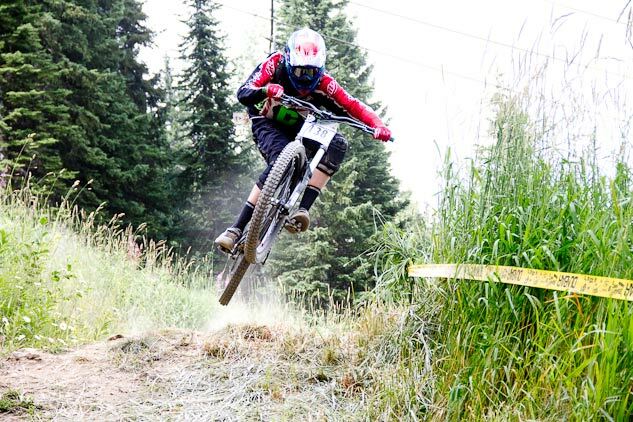 Nic styling it out during his race run at the Western Open BC Cup in Golden.